Drug discovery platform is a research and development platform where medicines are discovered and are formulated. In recent years, the drug discovery platform is observing great adoption of digital technologies. For instance, some key players are storing large data in cost effective manner in the cloud based drug discovery platforms. This platform enables many customers to overcome different challenges by establishing a network of web and mobile accessible applications. It enables secure and collaborative project management and the capability to share project information. The global cloud based drug discovery platform market was valued around USD 4.5 Billion by the end of 2027. The CAGR of global cloud based drug discovery platform market is around 13.5% during 2017-2027. The increasing market growth can be attributed to increase in the implementation of cloud-based platforms in various application segments. Rise in adoption of cloud based mobile applications for various drug discoveries is also a reason for the expansion of the market size. The global cloud based drug discovery platform market can be segmented on the basis of type and application. On the basis of application, it is further segmented into pharmaceutical companies, hospitals, biotech vendors and contract research organizations. 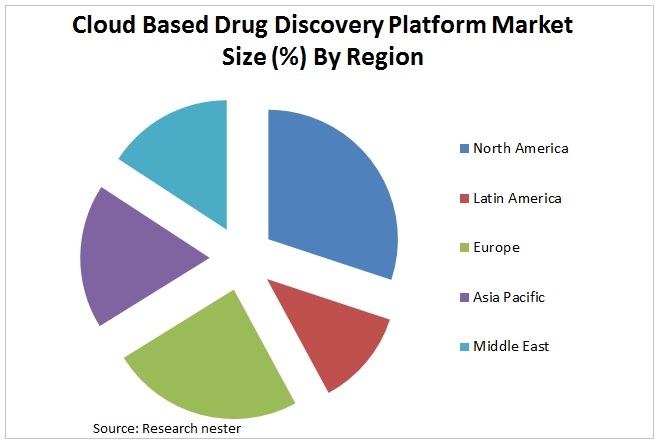 The pharmaceutical sub-segment is the leading end-user segment in the global cloud based drug discovery platform market. The constant rise in demand of drug from the various pharmaceutical companies is expected to drive the market growth of the cloud based drug discovery platform. The various growth drivers associated with the global cloud based drug discovery market are increasing implementation of cloud-based platforms in the healthcare industry in order to improve research efficiency. The various developing technology such as machine learning and artificial intelligence enable better discovery and formulation of drug around the globe. The various regional healthcare companies are collaborating with the international healthcare market players in order to adopt cloud based technologies which will enable better discovery and identification of diseases. Cloud-based drug discovery platform can be accessed by many devices such as computers, notebook, and mobiles. Various issues related to correlation of applications with devices are expected to hamper the market of cloud based drug discovery platform. WuXi AppTec (Shanghai) Co., Ltd.